The press release accompanying this single is interesting; the single itself barely gets a mention while the latest tour and all of the well-known Smiths tracks used as additional tracks on the various versions all get heavy coverage. So what’s that all about then? What it’s all about is that the single just isn’t very good and none of the attempts to polish it with rare tracks are going to make it any better. Although I was never a Smiths fetishist in the ‘80s, I always thought there were loads of good songs and a few great songs in there. 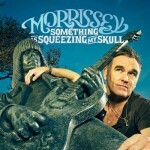 Even with Morrissey’s solo material I’ve heard songs that I thought were truly outstanding; and then this came along. Lyrically it contains the worst of Morrissey’s themes; self-pity and ennui with a little touch of prescription drugs thrown in for light relief. With Kurt Cobain you knew it was serious and Eminem will play it for laughs but these lyrics sound like a bad Smiths pastiche. Musically, the overall impression is that Morrissey’s trying to indulge his perennial New York Dolls obsession with a nod in the direction of early Pistols as the band thrashes its way through the mercifully short two and a half minutes. The Morrissey obsessives will probably love this but I think we deserve something better from someone with his reputation and history. Despite all of the band’s energy, somehow it all feels a little bit lazy and that isn’t good enough. A disappointing choice for a single.